As you can see, the results vary a bit, which is no surprise since those different renderers surely have differing precision/performance goals or just a different way to render the lines. For lines close to perfectly horizontal/vertical lines they’re pretty similar, showing clearly the “roping” effect I mentioned above. For lines close to 45 degree angles the JAVA2D renderer seems to look a bit better. So, to move forward, here’s a magnified illustration of the technique how I’m drawing lines using two quads having a gradient going from 100% in center to 0% towards edge. In actual rendering that gradient ramp is done in alpha channel, but for these example images I’m using green background and a ramp from white to black to show more clearly what’s being done. I’m basically just building on top of somebody else’s basic idea about how to render hardware accelerated lines by constructing polygons with gradient fins yourself instead of using a call to draw line primitives. I don’t know whose idea this is originally, having heard this a few times from different sources, but to fully research this subject you’d need to go back 30 years or so (check the short list of related links at end of this post). When the roping issue of anti-aliased lines is discussed, I have noticed that often somebody knowledgeable enough says it’s actually a gamma issue. The problem here being of course the fact that there are many ways to tackle the gamma thing, where none of them are a silver bullet solution which wouldn’t bring a host of other problems with it. I got the idea that I could modify the above technique to draw two 0.5 unit wide fins per side, and apply gamma correction at the halfway. This would be still very simple and low-tech way to draw gamma corrected lines. As I said above, the “no gamma” case looks very close to the gamma corrected one on different hardware, but the gamma 2.2 corrected case looks identical on the few machines I tried this on. I’m not sure what’s going on with that, hopefully somebody can explain it to me. I don’t have any explicitly enabled “gamma correction” features from drivers. A few observations from the images. With the above technique even the perfectly horizontal and vertical lines get a small halo to nearby pixels. What’s good though is that the perceived brightness stays same very well regardless of line angle. I think a bit of the roping effect has crawled back in, but the perceived brightness between angles is pretty much ok.
Here’s test code, runnable inside Processing. What’s additionally not visible in the example images above is the fact that the default renderers clamp coordinates to integers, while this method allows you to draw lines with perfect sub-pixel precision. The test code is modified to offset the lines by time slowly so you can see that in action. If you want to try the regular lines reference test case, replace the renderer in initial size() call to P2D/P3D/JAVA2D, and replace the call to testAALines(…) in draw() with the commented call to testLines(…). Anti-Aliasing Through the Use of Coordinate Transformations (K. Turkowski, 1982) (paywall). Additional credits/thanks: I think I learned first time about using simple gradient instead of other tricks (like textures) from Mikko Mononen. Raigan Burns noted that the line being a bit fat and “bleeding” into adjacent pixels is actually a feature, since that way the lines actually look a lot better in motion. Alex May told me that most of Eufloria game’s drawing works like this, except for using texture for drawing the lines and having a bunch of textures with different gradients to get different visuals. 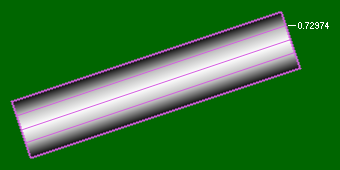 The gradients are circular and lines are drawn using a cross section of the texture, with rest of the texture used to make caps for round-ended lines. And you can do so much more with that idea too! It does lines, rectangles, rounded rectangles and convex polygons too. I have variable called fth (feather) on all the draw functions, which allows me to do stupid things like draw drop-shadow boxes too. Or you could do glowing lines, etc. That gamma trick is awesome! It should make the drop shadows look much better too. Linear gradient makes them often too “puffy”, x^2 looks much better. Some of the related links go to dead ends now; specifically, “GPU Gems 2 chapter 22: Fast Prefiltered Lines” and “OpenGL Invariance: Texture AA”. Also, the article “Anti-Aliasing Through the Use of Coordinate Transformations” is sadly locked behind a pay wall. Thanks, I fixed the broken links now. And yes, unfortunately one is behind a paywall.